The Quad has been hit by four daytime burglaries since Monday, with looted items including electronics, jewelry and cash, a police department spokesperson said. 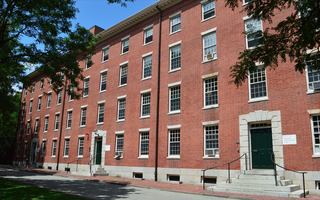 Harvard University Police Department (HUPD) spokesperson Steven G. Catalano said students reported three dorm-room thefts in Cabot House and one in Currier House. None of the rooms showed signs of forcible entry. A cell phone charger, camera, laptop, DVDs and jewelry were reported stolen from Cabot House over the three-day period. And a laptop, jewelry and cash were reported taken from Currier yesterday. Cabot House Senior Tutor Stephen H. Kargere wrote in an e-mail to his House list that an older blond man carrying a backpack had been seen around the House. The man has reportedly been holding keys and knocking on people’s doors, asking if anyone has lost their keys. There is no evidence that this man is related to the burglaries, Kargere said in an interview yesterday, but warned that students who see suspicious individuals in the area should call HUPD. Although Catalano said details of the investigation are confidential, he confirmed that HUPD has responded to reports of suspicious activity in the area during the past few days and is continuing to look into the case. Catalano also said it is unclear at this point whether the burglaries were committed by one or multiple offenders. The theft on Monday occurred between 9 a.m. and 3 p.m., according to Catalano. One of Tuesday’s thefts took place in the morning, and the other in the afternoon. The final burglary occurred sometime between Tuesday and Wednesday morning. The thefts were discovered when residents returned to their rooms and found the items missing. To decrease the risk of theft, Catalano advised students to lock their doors, to avoid letting others “piggy-back” when they swipe into a dorm and to call HUPD to report any suspicious activity. Kargere said he reiterated the same warnings to the Cabot House list, and added that move-in is a particularly hard time to keep the House secure—especially when it comes to locking doors. “People are moving in and out, and there are parents that people don’t recognize,” he said. —Staff writer Hana R. Alberts can be reached at alberts@fas.harvard.edu.